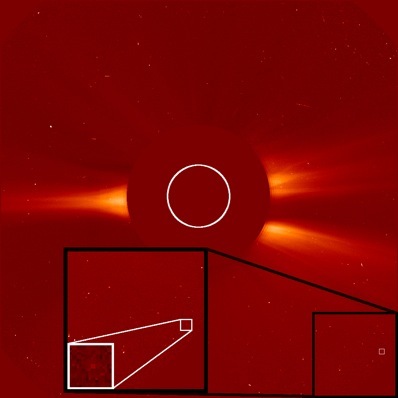 The SOlar and Heliospheric Observatory (SOHO) is celebrating the discovery of 1,500 comets since the mission began 13 years ago, making it more successful than all other comet discoverers throughout history put together. The ESA/NASA SOHO spacecraft has just discovered its 1,500th comet. It is an extremely faint object, as you can tell from this zoomed in image! Image: ESA/NASA/SOHO. It is thought that around 85 percent of SOHO’s discoveries are fragments of an even larger comet that split apart in a death plunge around the Sun, probably many centuries ago. The fragments are known as the Kreutz group, Sun-grazing comets that travel closer to the Sun than 0.01 AU (1,460,000 kilometres), and the latest fragment to be discovered, a small and very faint offering, also falls into this category. At this proximity, which is a near-miss in celestial terms, most of the fragments are destroyed, evaporated by the Sun’s fearsome radiation. From SOHO’s privileged location between the Earth and the Sun, all this happens under the watchful electronic eyes of the Large Angle and Spectrometric Coronograph imaging system. A huge network of volunteers then sift through the images for a tiny speck that betrays the presence of a comet. When someone believes that they have found one they submit their results to Karl Battams at the Naval Research Laboratory in Washington, who checks the data before submitting the candidate comet to the Minor Planet Centre where it is verified, catalogued and its orbit calculated. SOHO comets 999 and 1000 marked a previous milestone on August 5, 2005, both of which were discovered by Toni Scarmato from Italy using images from the LASCO instrument, which was built and is operated by the LASCO consortium of the Naval Research Laboratory (Washington D.C.), The Laboratory for Space Astronomy, Marseilles (France), The Max Plank Institute for Aeronomy, Lindau (Germany) and The Department of Space Research, Birmingham (UK). Image: LASCO/SOHO/ESA/NASA. SOHO has been in orbit around the Sun for 13 years, monitoring the Sun’s activity and the local solar environment. "Catching the enormous total of comets has been an unplanned bonus," says Bernhard Fleck, ESA SOHO Project Scientist.